Days like today are the days I realize how much I’ll miss Prescriptives when it’s gone for good. Although many of you expressed sadness and outrage over the base makeup items in the collection, I’m actually quite saddened over the limited edition items. I really enjoy special collection releases from Prescriptives and this year’s Lustre Holiday Color Collection is truly brilliant. Stepping up Holiday with an array of color gift sets, plus the new Holiday Cheek and Eye Palette, and now a full color collection, Prescriptives is going out with a bang. 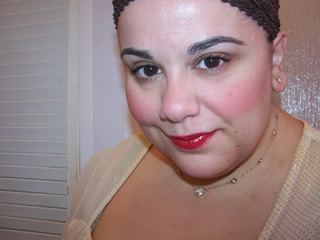 Check out some of Prescriptives Lustre Holiday Color Collection after the jump! Prescriptives Lustre Holiday Color consists of two new eye palettes, highlighting powder, lipsticks, and glosses. As always Prescriptives caters to both those who enjoy warmer or cooler shades. I’m leaning towards loving the warmer selection of shades as that’s what I tested out and I’m also on this brown shadow kick lately. Prescriptives Warm Lustre Baked Eye Color Quad is a quad of baked shadows with a subtle shimmer finish that compliment my brown eyes beautifully. The shades include a creamy white, brown, copper, and brass. The shadows aren’t heavily pigmented so you can get more of a softer look, the lack of heavy pigmentation actually makes them easier to work with, blend, etc….you can of course build color up quite easily and create a softer or dramatic look. The quad is a dream come true for me because as I said I’m a bit of a brown kick lately. I wouldn’t call them festive but they fall into the realms of elegant. Prescriptives Lustre Shimmer Cheek Color is perfect for a soft focus dash of color on cheeks. It has a subtle shimmer finish and nice soft, silky formula that’s easy to blend. The warm version is a peachy brown base which gives a golden glow to my cheeks and face. Prescriptives Moonbeam Reflective in Rose Gold is a warm rosy golden peach which pairs up beautifully well with the warm cheek color and eye palette. The texture is beautifully pigmented and easy to layer on with a brush applicator (hate sponges). It wears incredibly long on my lips and creates a beautiful shimmery reflection. Overall, I’m quite partial to this collection at the moment. The complete look is more Fall than Holiday but it’s still ideal for evenings out when you aren’t up for the Holiday norm of golds and silvers. Now that I’ve tried the warmer shades I think I’ll head in and peek at the cooler as I really loved the eye quad in particularly and absolutely adored the gloss. I’m going to say this is a Muse Approval for me. The look is very flattering with my coloring. Likey alot. Worthy of a haul. Anyone have plans to snag any of this? What will you miss from Prescriptives? Oooh it’s a lovely set. I love all of the items. I would love to haul (or have gifted) entire collection as fond adieu to Prescriptives. Prescriptives was one of my favorite brands as a teenager for foundation and was my go to when ever other foundation failed. I think this collection is a beautiful way to go out. The colors are beautiful and look universally flattering. They are really nice shades 😀 I love baked shadows so it’s totally tickling me at the moment! 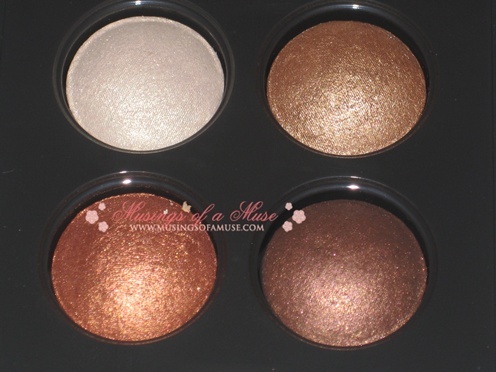 These shades look beautiful on the Muse! I will miss Px’s. I remember when it launched. That sure dates me, doesn’t it?! I purchased the cool shade of the highlighting powder and it came with a free mini Moonbeam gloss in Stellar. Aww 🙁 Sniff sure will miss it too Kate! Oh muse, you break my heart again! First you tease me with the stila foundation, and now this! I love love love Prescriptives and am hoping that the line going bye bye is some sort of weird Estee Lauder joke. Do you know if they’re switching any of the products to other sister lines? I know that they’re keeping Calyx around (sadly, kind of a snore, in my opinion). The eye shadows look so pretty, I might have to go to Macy’s later today to check this out in person! I called Prescriptives today to ask if anything else would be switched to the sister lines and they said that everything else is being discontinued. I can’t believe that a cult product such as Super Line Preventor could just disappear. I’m gonna have to seriously stock up before it goes! awww I’m so sorry bakeneko! I figured as much! The best thing now is to go to CCO as I bet they get it ALL in stock when the counters finally close down! as for super line preventor have you checked out soap and glory? they have some line filler treatments, it’s not Prescriptives but maybe you’ll find a new HG! The one I use is the line serum, in the funny little pink bottle. It is brilliant for hydration and can be used right up to the lash line without causing irritation or puffiness. I don’t have lines yet, but as I’m 30 on Christmas Eve I’m expecting them to make an appearance in the not too distant future! hi suzy cosmetic company outlet 😀 Hope this helps hun! aww I hear ya bakeneko! sigh….sniff!